We’ve made many promotional campaigns for Canon. All have been in multiple languages, usually 18, sometimes 24. This example, for a Cashback, involved making a wide range of in-store marketing tools and deliverables: many of which you see here. 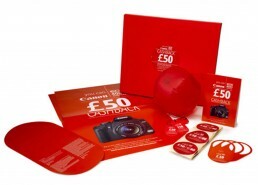 ‘Lens cards’, in store posters, stickers, inflatables, in store DVDs are a few examples. As with most Canon promotions it was a great commercial success and achieved sell out of the features EOS 50D camera range.